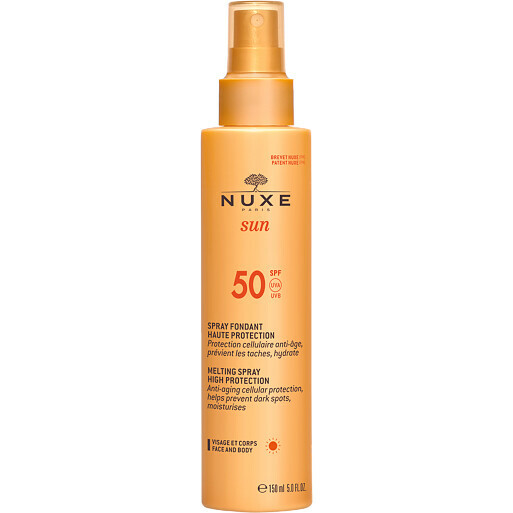 Keep your face and body protected in high heat with the Nuxe Sun Melting Spray SPF50, a practical lotion that defends your skin. The easy-to-apply Sun Melting Spray SPF50 works hard keep skin safe when in contact with UV rays, preventing ageing and the appearance of dark spots with its broad-spectrum protection. The lightweight texture and energising scent make applying SPF an easy and enjoyable experience, particularly as it leaves no white marks and is water and sweat resistant. The scent of summer in a bottle, the Sun Melting Spray SPF50 is enriched with exotic fragrance notes of sweet orange, vanilla and Tahitian gardenia to uplift and relax the senses as you apply. Apply liberally to the face and the body before sun exposure. Reapply frequently, especially after swimming or towel-drying the skin. Alcohol-free, paraben-free, mineral oil-free, photostable, non-comedogenic.